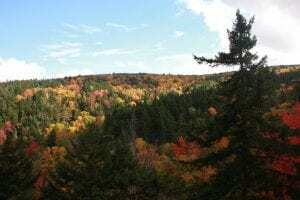 With a population of just over 500 people, it’s easy to overlook the small mountain town of Sugar Hill as you drive north through Franconia to Littleton up I-93. But, this small town packs a real punch. Sugar Hill may be New Hampshire’s newest town, but its history runs deep in the western White Mountains. After splitting from the nearby town of Lisbon in 1962, Sugar Hill is New Hampshire’s most recent incorporated town. Named after the large grove of sugar maples in the town, Sugar Hill was a fashionable Victorian resort town attracting artists and wealthy businessmen and their families from New England cities during the 19th century. While the grand resorts of yesteryear are now gone, Sugar Hill is still a travel destination in itself. With community staples like Harman’s Cheese & Country Store and Polly’s Pancake Parlor, which was named a James Beard Foundation Award American Classic in 2006, and lots of festivals throughout the year, there is a lot to do in this small New Hampshire town. People come over from all over New England to eat Polly’s famous pancakes made from scratch and topped with New Hampshire maple syrup. 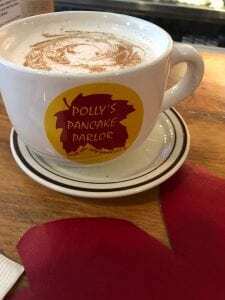 For over 80 years, Polly’s Pancake Parlor has been serving short stacks of buttermilk, buckwheat, gingerbread, and other flavored pancakes to hungry folks. Everything is made from scratch using locally sourced ingredients whenever possible, and the maple syrup is from Fuller’s Maple in Lancaster. The restaurant is just as unique as the menu. Situated in an 1830-vintage building on the historic Hildex Farm, tables overlook the beautiful countryside of the White Mountains. Polly’s is still operated by the same family. Polly’s granddaughter, Kathie Aldrich Cote and her husband Dennis, have been running the restaurant since 1981. According to Kathie, last year alone, Polly’s served up about 255,000 pancakes. “And that’s just pancakes and not waffles,” she finished. 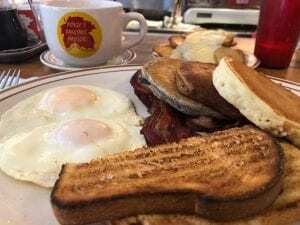 Unlike other restaurants, customers have access to unlimited maple syrup, pure maple spread, and pure maple granulated sugar, which is made in-house. “Another unique feature is that each server makes all their own customer’s pancakes and waffles,” says Kathie. After getting your sugar fix for the day, make sure you pick up some pancake mixes and maple syrup from the shop. Who doesn’t love cheese? John and Kate Harman started Harman’s Cheese & Country Store as a mail order business in 1955. In 1981, the Aldrich family took the reins from John & Kate to continue building upon their dream. Named the “World’s Greatest” by many customers, Harman’s cheese is a natural, premium grade, white cheddar made in New York from whole milk. The small country store in Sugar Hill sells over 13 tons of the cheese to people from just down the street to those who live all the way in Saudi Arabia. While the world-famous cheese might be the main reason you stop by Harman’s, the country store carries hundreds of additional locally made products. From cheese tools to jams and jellies to mustards and pickles, you’ll find unique gifts to remember your vacation in the western White Mountains for weeks to come. 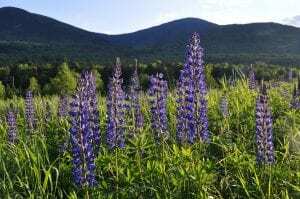 During June, the population in Sugar Hill more than triples with the influx of visitors trying to catch a glimpse of the colorful lupines that dot the hillsides and gardens in northern NewEngland. The Lupine Celebration runs all month long with a few select dates for special events, like the Open Air Market. The Open Air Market will be held on June 8 -9, 2019 on Main Street, and features over 75 artisans, non-profits, attractions, clubs, and more. Local food trucks and vendors will be selling delicious food all weekend long, so make sure you bring your appetite. Throughout the month there are numerous concerts, art exhibits, and artisan demonstrations. Of course, the real star of the show is all the colorful lupines around town and the countryside. Get up early, grab a cup of coffee, and drive around to find the best spots to photograph the famous summer bloom. The White Mountains are famous for their colorful leaves and scenic views after a long hot summer. Similar to the Lupine Celebration, the people of Sugar Hill celebrate the change of season with a massive celebration in town. Held annually in late September, the Autumn Celebration is an open air market with over 50 local and regional vendors. Start your Christmas shopping early with lots of art and crafts, locally made food, and handcrafted goodies. Throughout the weekend, there are talks, musical performances, and more. Next time you’re driving North up I-93, hop off Exit 38 and head into town and discover why Sugar Hill is one of New Hampshire’s best-kept secrets.